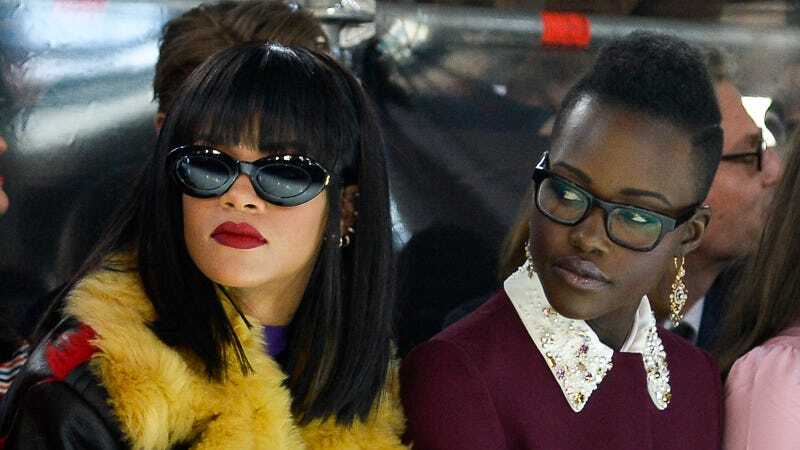 The movie idea starring Rihanna and Lupita Nyong’o—a pitch that appears to have originated on Tumblr and migrated to Twitter, where it transformed into a fully formed film—is now miraculously being made into a real movie. Hello, I’m your captain and this is 2017. Ava DuVernay is reportedly on board to direct the movie, and Insecure’s Issa Rae will write the script. Entertainment Weekly reports via sources that the project was solidified following negotiations at Cannes. Netflix, with its fat pockets and money bags, emerged victorious after “a very aggressive bid, beating out multiple other suitors.” A representative for Issa Rae confirmed the news to Jezebel in an email. A Tumblr user (@elizabtchtaylor) shared the same photo two years ago, with the caption: “They look like they’re in a heist movie with Rihanna as the tough-as-nails leader/master thief and Lupita as the genius computer hacker.” But it wasn’t until this year that Twitter strongly supported the idea to the point of making it viral. EW’s sources confirmed that production is slated for early 2018 after DuVernay wraps A Wrinkle In Time. Below are four tweets, among many others, that contributed to making this movie (reportedly) happen, though I still won’t believe it until it’s in front of my eyes. What other movies can Twitter force Hollywood into producing next? Or maybe it’s best to keep your friends and enemies close and protect your genius.